I had a great Thanksgiving, how about you? I ate my weight in mashed potatoes, bread and stuffing (I'm a total carboholic) and I got to spend some time with one of my best friends, my brother. Derek lives in Pennsylvania, which isn't thousands of miles away, but still not close enough for me to see him all that often. I know it'll pass, but for about a week after he leaves, I'm a little down in the dumps. Luckily, he'll be visiting over Christmas, so I don't have too long to wait! Now, on to the happier stuff! 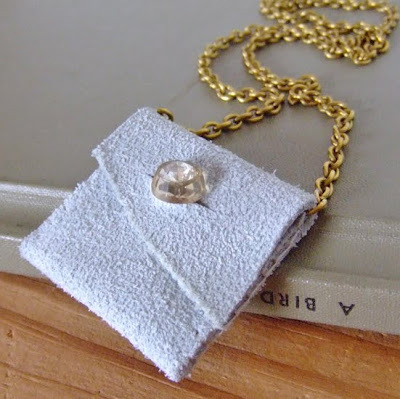 I love leather (but the recycled scraps since I'm an animal lover), so it should come as no surprise that I'm totally in love with making and wearing these little leather pouch necklaces! I made an itty bitty one for myself to keep a few of Miss Flojo's feathers with me, and I currently have a few photographed and for sale in my shop, but there are more on the way! So, I just discovered a rad little shop at big cartel yesterday. Paola Loves To Shop has cute little accessories at uber cute prices. I treated myself to a pretty plaid scarf with shades of blue, pink and orange on a white background (I'll add a picture when I receive it), and the little gem was only $5. Yeah, that's right, $5. 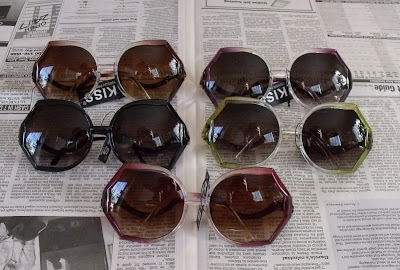 I should have gotten these as well, but I plan to purchase them soon; I love sunglasses! So far, I've uploaded about 150 pictures to facebook and I still have quite a few more, plus videos! I promise I won't obsessively share all of those on this blog, but since I always like to see what others are doing, I figured I'd share as well. 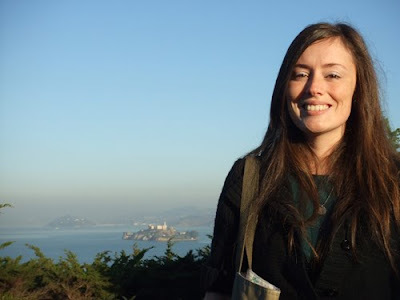 Also, do you ever wonder what the person behind the blog/shop/computer looks like? I know I do, and now you know what I look like (in case you're as curious as me). From the top: looking down (all the way down) from the Golden Gate Bridge, and me at the Golden Gate Bridge. From the top: looking down the Greenwich steps. 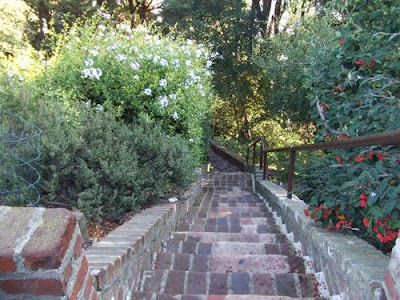 If you've ever watched "The Wild Parrots of Telegraph Hill," you'll remember that Mark Bittner lived in a cottage on these steps! 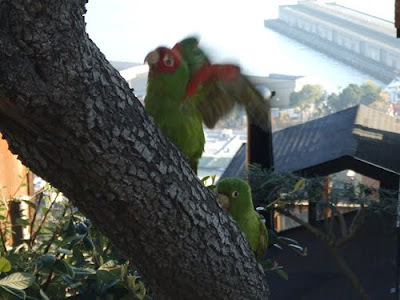 The next three pictures show a wild cherry headed conure and her baby (you can tell the baby is only a few months old because of the lack of red feathers). 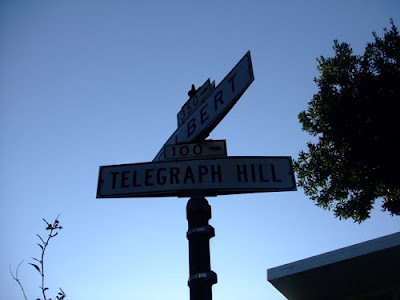 Lastly, Telegraph Hill is my absolute favorite place in San Francisco. 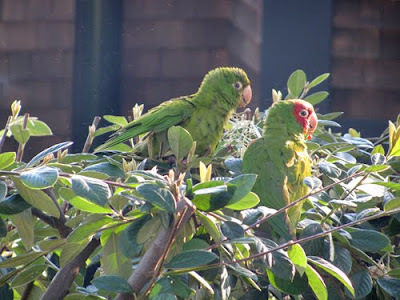 Not only is it beautiful because of the view and lush landscaping, but the parrots make it absolutely magical. 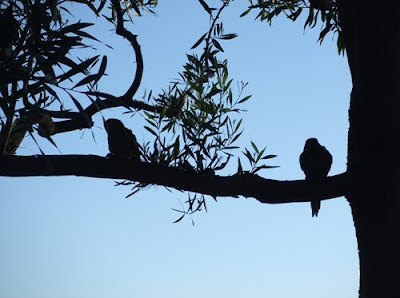 We saw about 50 parrots and got close enough to touch them, but I didn't, I only took pictures (and they're the main reason I want to go back so badly)! 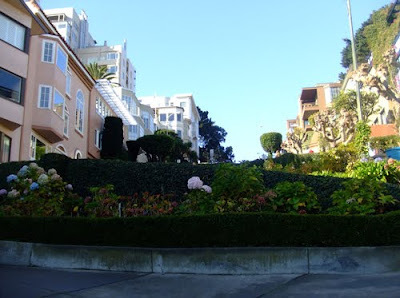 From the top: Lombard Street is so much more beautiful than I would have thought, and the landscaping inside of the curves is just gorgeous! 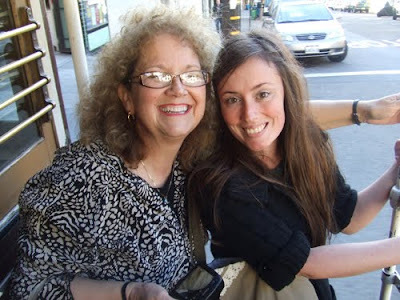 The last picture is of Amy and I, she's Mr. Dinosaur Toes' aunt, and she was nice enough to take me on this girl's only trip! I'll be back with more San Francisco (or as I like to call it, "my home away from home) pictures, but first, look at my new treasures! I got these from Michelle, the sweet shop owner of storybookcharm on Etsy. 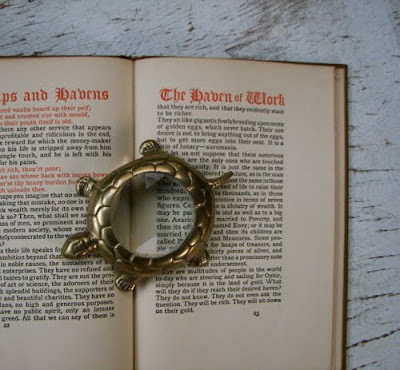 The adorable little turtle is a magnifying glass, and while my vision is still 20/20, it never hurts to give your books such a cute companion. 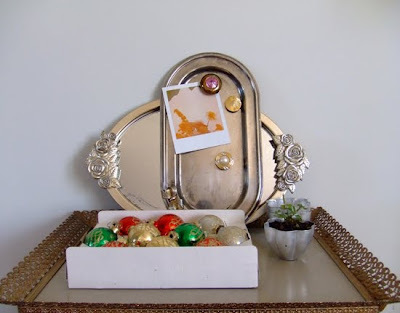 As you read a few posts ago, I've gone gaga over tarnished silver knick knacks! 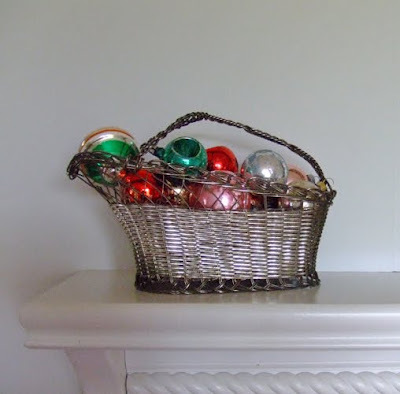 This basket is beautiful and makes a nice home for my antique mercury glass ornaments on my mantle. 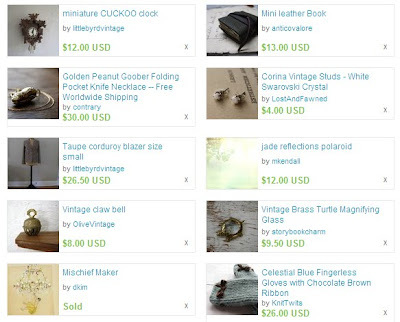 There are lots of other vintage goods in her shop, just see for yourself! I'm back home, and I must admit that while I'm happy to see my beautiful Flojo and Mr. Dinosaur Toes, I'm not happy to be back in my hometown. I've never been the kind of person to feel sad or lonely upon returning from vacation, but I think it's because I've just never been to the right place. Until now. 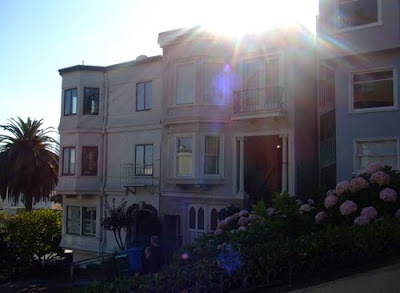 It's like that city was made for me, and I'm determined to go again ASAP! Here are a few pictures from our trip. 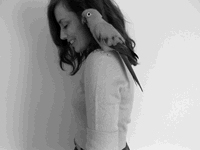 I have LOTS more, but they require stories (especially the wild cherry headed conures), so they come later! 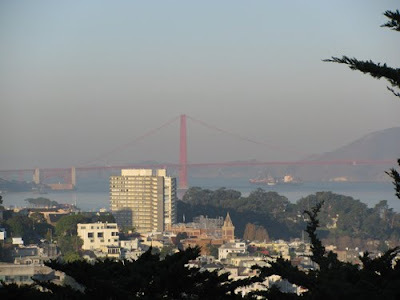 From the top: Golden Gate Bridge from the top of Telegraph Hill (my favorite place in San Francisco), Me on Telegraph Hill, Coit Tower. Last night, Mr. Dinosaur Toes and I went to dinner with friends and then came back home for a few rounds of Rook. Unfortunately, I didn't get much playing done as I think the cooks at the restaurant were trying to kill me! My food wasn't cooked like it should have been, but I was too shy to say anything, and now my stomach is telling me I should have spoken up! I hope I'm feeling better REALLY soon because I have laundry to do for my trip, and today is the last day I have to do it! 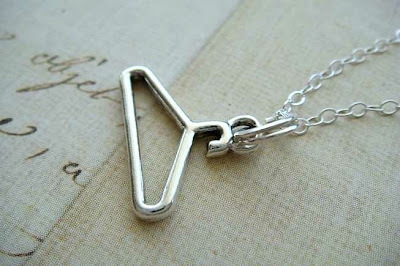 Coat hanger necklace from charms4you on Etsy, $10. After the laundry is finished, I've got to get busy drilling some shell casings because I only have 4 left! A friend of mine gave me a whole container full of spent casings yesterday which I really appreciate, and as much as I love shooting a handgun, I'm just not sure I have the time today to fit anything else in! So kids, the moral of this story is - you can expect to see some new bullet necklaces in the shop soon, and a few new stones! Until I return from my trip with thousands of pictures, au revoir! 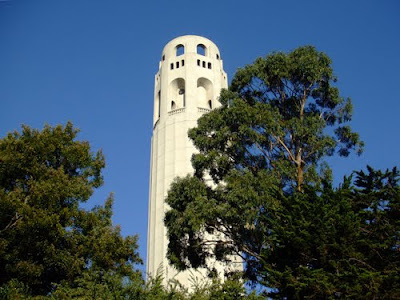 san fran, here i come! A homebody to the core, I'm never big on vacations, and when I do go, I like to stay somewhere within a few hours from home. 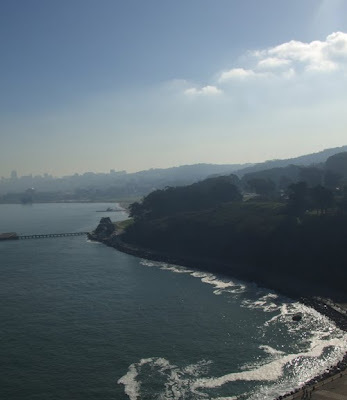 So San Francisco is going to be a big change from Virginia! My husband's aunt is taking me, free of charge, for a short trip packed full of girl talk and sightseeing! I'm super excited, and I'll start packing tonight since I know I'll switch the outfits no less than three times. Mr. Dinosaur Toes has been trained in the art of packaging and next I'll show him how to list items in my store, so he'll be taking over for a few days. I promise to share lots of pictures when I'm back home on the east coast! 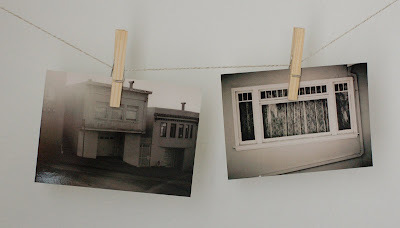 Invisible Colours postcard set (taken in San Francisco) from idathue on Etsy, $4. Found at owlyshadowpuppets on Etsy, $12. I found this great shop yesterday, and I just can't get enough! 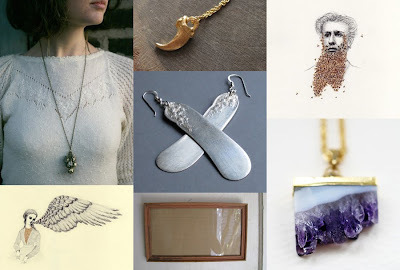 Being inspired my nature myself, I love the earthy, natural style of the jewelry, and I could see it with any outfit imaginable! 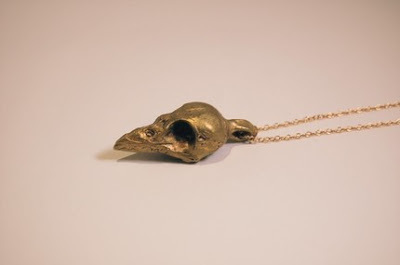 Two of my favorites are the Owl Claw Necklace, $85, and the Sparrow Skull Necklace, $45 (both pictured below). Visit LuxCoronette for yourself! Maybe it's from living in a house filled with antiques as a child. Maybe it's from spending so much time with my mom at flea markets and antique shops when I was young. Or maybe it's because I've got an old soul. For some reason, I'm just not thrilled with the new things, but I swoon over those gems with chips, scratches, tarnishing, and little stories to tell of a previous life. If I'm not at home, you'll probably find me in one of three thrift or junk shops! I'm not finished photographing all of my finds, but here are a few! From my first trip, I got a huge old brass frame with rosettes in the corners and filigree edges. Again, keeping with the "old is gold" theme, I won't put an ornament on my tree unless it's older than me! I got this box of glittered glass balls, and by the look of the box, I'd say they are from the 60's or 70's...$2! 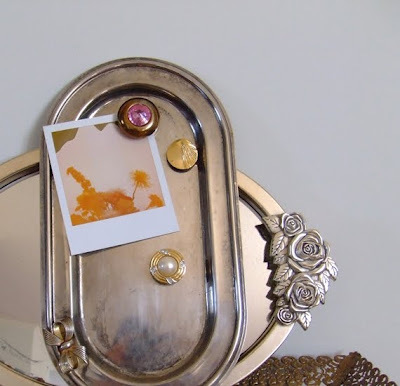 The pretty mirror with roses isn't super old, but I know it's lived a life by the age spots on the mirror and the faded look of the silver. I can't wait to hang it! 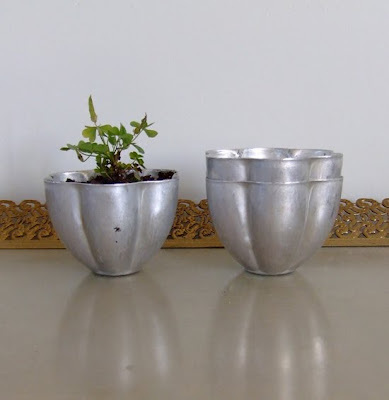 I fell in love with these aged aluminum tart molds! I put a little plant in one and I figure I'll use the other two for the intended purpose. $1 for the set. My absolute favorite find from that trip is this little dreamboat of a tray! Oxidized and aged to perfection, It has the sweetest little bow attached to one end, and it'll be perfect in any room in my house! I'm not sure where or how I'll use it yet, but it makes a great magnetic memo board with the magnets I made to sell in my shop! I'm never able to keep track of when the treasury spots are opening, and on the off chance I DO happen to get one, I'm at a complete loss. All the hype gets me nervous and worked up so I forget what sort of treasury I wanted to make to begin with! Anyway, I was looking through my favorites today (because sometimes I just feel like buying stuff), and I thought, "Danielle, I do believe this looks like it would make a nice treasury." So, here it is, kids. So, I made my Christmas list a little early. I know, I know, I'm too old to make a Christmas list, but it doesn't mean I don't covet these little treasures and secretly (or not so secretly) wish they were mine! I put it on Facebook, and if all goes as planned, my husband just may be paying attention! Pyrite cluster necklace by acommonthread on Etsy, $30. 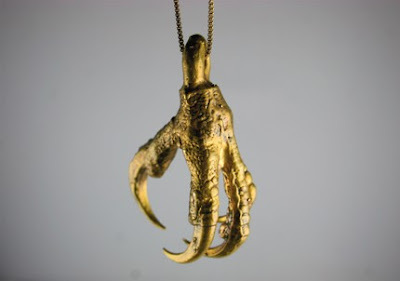 Fox claw necklace gold vermeil by Odettenewyork on Etsy, $125. Bee beard by ohmycavalier on Etsy, $23. Knife blade silverware earrings by ballandchain on Etsy, $18. Wing by ohmycavalier on Etsy, $23. Vintage shabby pink frame by littlebyrdvintage on Etsy, $12. Amethyst wedge necklace by crumpetcake on Etsy, $27. And one more that I would really, really like to have seems to have eluded the wishlist collage. That little gem would be... camel twisted cowl by sanchia845 on Etsy, $35. I've recently become completely smitten with all things silver and tarnished. Forget "old is gold," as I think the more appropriate term would be, "old is tarnished, greyed, darkened, slightly worn silver!" 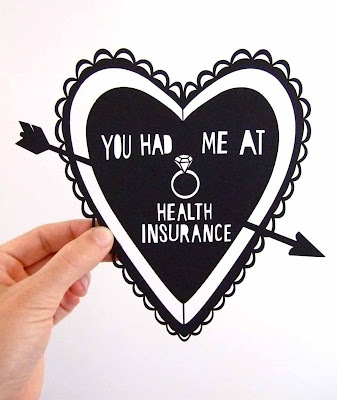 In my perusing, I've come across a few pieces on Etsy that I'd rather not live without, but because I'm a bit of a cheapskate, I probably will. 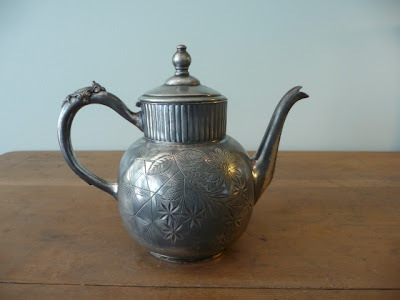 Silverplate teapot from saltydoghome on Etsy, $68. 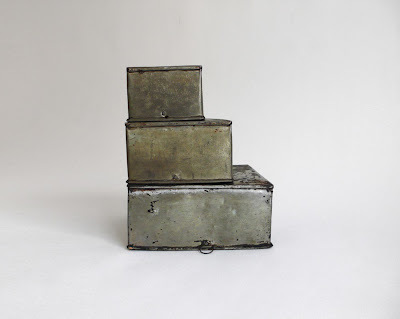 Tin square boxes from Hindsvik on Etsy, $25. 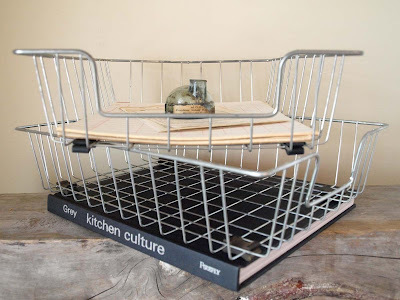 Industrial mail wire basket set from AMradio on Etsy, $16. 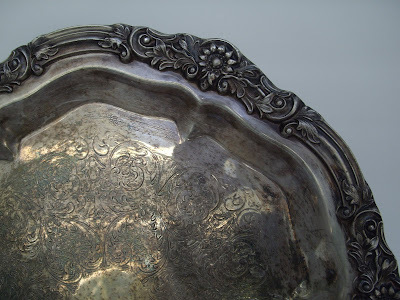 Vintage large silver plated serving tray from IslandBunnyExchange on Etsy, $25.99. 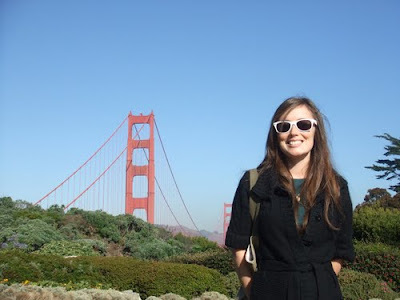 And just because I like the song, which happens to have the same title as this blog post, here's Rilo Kiley for your listening pleasure.